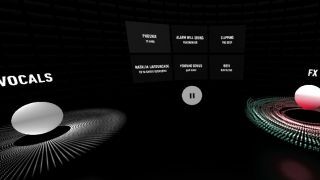 Google has teamed up with popular podcast Song Exploder to offer music lovers a new way to see and hear their favorite music. The interactive experiment is inspired by the way the Song Exploder podcast invites artists to dissect their most famous songs and explain to listeners how each instrument comes together to create the final product. Called Inside Music, the project gives users the freedom to step inside a song and take it apart for themselves. When you start up a song, you’re taken into a three dimensional space where each of the song’s individual components such as vocals, guitar, synths and piano will surround you. From your central position you’ll be able to turn these individual elements of the song on and off and as a result of spatial audio you’ll be able to hear how these different layers come together effectively. By doing this you might find a new appreciation for instruments in a song that were once drowned out, or you might discover that a song you once hated is vastly improved simply by removing the crooning vocalist. At the moment Inside Music features song by artists such as Phoenix, Perfume Genius, Natalia Lafourcade, Ibeyi, Alarm Will Sound, and Clipping. However, Google has made the code for the project open source on GitHub which means that any aspiring musician can create interactive experiences around their own music. While VR is probably the most interesting and literal means of stepping inside the music, those who don’t have a headset to hand can still use Inside Music. As the project was created using WebVR, it doesn’t require the installation of any additional apps or software to use so those interested can still use it on their laptop or phone. However, if you do have even a Google Cardboard to hand, we suggest slipping your phone into it and you’ll easily pass a couple of hours here.